Perform general welding tasks on pipe shapes solids and rounds from 1/8" to 36". Comes equipped with formed steel legs for great stability. The Sumner 780475 Hi Pro-Jack with Stainless Steel Vee Head features durable, formed steel legs that provide amazing stability while working on welding projects. Stainless Steel Vee Head is perfect for general welding of pipe shapes, solids and rounds. Pipe Size: 1/8" to 36"
Features a Fall Guard that allows a 1" safety zone around the lockwasher. Equipped with a 1-1/2" Acme fine adjustment thread. Superior lateral support provided by the strut tension plate. 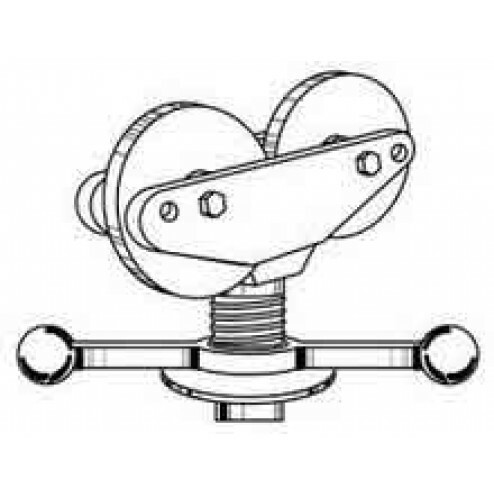 Set screw is designed for double margin of safety. Also features a large, convenient adjustment handle for hassle free adjustments. Jack head can be locked into place for safe transportation. The quick action lockwasher is designed for fast and easy height positioning. Load tested for quality assurance and has been built for heavy use and abuse.